Sushi is popular domestically and internationally. Like the majority of other Japanese dishes, sushi is devised to accentuate the natural flavors of fresh fish and shellfish. The season of the year is an important factor in the selection of materials . There are several variations of sushi: all are flavored with vinegar. One of the most typical variety is Nigirizushi, highly vinegared oblong-shaped rice ball with a slice of raw fish, shellfish and other food placed on top. It is eaten by dipping soy sauce with grated horseradish (wasabi). Sushi can be eaten by hand or using chopsticks, although traditionally it is eaten with the fingers. When dipping, be careful to use soy sauce sparingly for not overwhelming the flavor of the fish. At a traditional sushi shop, sushi is prepared before the customer’s eyes by cooks or a combination of sushi is served in a lacquered box. The traditional sushi shop has a single clean counter of beautiful wood and a few tables. Nowadays a revolving sushi shop(kaiten-zushi) is increasingly on rise. Besides Nigirizushi, there are various types of sushi: 1 makizushi, sushi served rolled inside nori (dried sheets of seaweed) 2 inarizushi, vinegared rice ball stuffed into a small pouch of fried tofu, 3 chirashi-zushi , sushi served with toppings scattered over a bowl of rice. 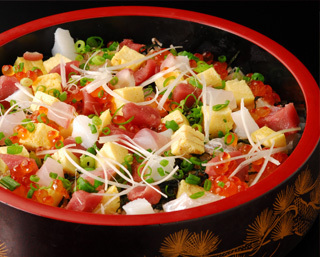 An assorted set of sliced raw fish for chirashi-zusi can be available at a fish shop located in a supermarket. If you are interested, give it a try. It is easy to make. The basic idea of sushi is the preservation and fermentation of fish with salt and rice. The oldest form of sushi in Japan is called Narezushi and it developed into Oshizushi (lit. pressed sushi) and at last Edomae nigirizushi, which is what is today known as “sushi”. .Sushi rice (known as shari) is white, short-grained, Japanese rice. Its essential quality is stickiness. that differs from long-grain kind such as India The cooked rice is cooled to room temperature before being used for sushi. ＊Fish eaten raw for either sushi or sashimi must be fresher and of higher quality. Only ocean fish are used raw for sushi, as freshwater fish are more likely to harbor parasites harmful to humans when uncooked. Commonly-used fish are tuna(maguro) , yellowtail (hamachi) and mackerel (saba)..
＊Seafoods such as squid (ika), octopus (tako), shrimp (ebi), clam , fish roe (ikura). sea urchin (uni), crab (kani) and various kinds of shellfish (abalone,, prawn, scallop) are the most popular seafoods in sushi. ＊Vegetables pickled daikon radish (takuan), fermented soybeans(natto), avocado in California rolls, cucumebr are used..
Shoyu; Known as murasaki. (lit. “purpose”), the common name for soy sauce. Wasabi: A piquant paste made from the grated root of the wasabi plant. Gari : Sweet, pickled ginger(shouga). Eaten to both cleanse the palate as well as to aid in the digestive process. Ocha: Known as agari, green tea (ocha) always served together with sushi. 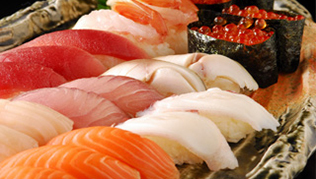 The main ingredients of sushi, raw fish and rice are low in fat, high in protein, carbohydrates, vitamins and minerals.. In Japan and increasingly abroad, conveyor belt sushi (kaiten zushi 回転寿司) restaurants are a popular, economical way of eating sushi. At the restaurant, sushi is served on color-coded plates, with each color showing the cost of the sushi The plates are placed on a conveyor belt. As the belt passes, the customers choose their desired plates. After finishing, the bill is calculated by counting how many plates of each color have been taken. Busy sushi restaurants serve the best quality, as the sushi gets eaten faster and does not get dry while rotating. Sushi at Kaiten-zushi is reasonably priced ranging from 100yen to 500yen per plate. In general, cheap items come on plain plates. They are also popular among foreigners, as no special Japanese language skills are needed to read a menu or to order. Let’s go to Kaiten-zushi nearby!